The Ganga occupies an unrivalled position among the rivers of the world. No other river is so closely identified with a country as the Ganga is with India. Nor has any river elsewhere in the world influenced to greater extent the life of the country through which it flows. Cities and pilgrimage centers teeming with temples and shrines have sprung up all along its course -milestones in the history of the land and the growth of Indian civilization. The Gangetic plain has indeed been the pole towards which the political, economic and religious life of the country has gravitated. It is little wonder, therefore, that the river should have caught the imagination of the multitude foreign visitors to the country through the ages. Travellers of different nationalities and religions visiting India from abroad could not but take not of the Ganga. They have left fascinating accounts of the river scene observed for varied, and we find detailed and delightful descriptions of customs and ceremonies, periodical fairs and festivals, flora and fauna and the picturesque spots and pilgrimage centers, which they came across in the course of their travels along the Ganga. Besides exhaustive extracts from the foreign travellers accounts included in this anthology, the book is also illustrated with some of the fascinating sketches of the river scene made by the landscape artists among them as they went up and down the river. Jagmohan Mahajan has been engaged in a study of the Ganga for the several years. He is the author of The Ganga Trail: Foreign Accounts and Sketches of the River scene and the text of the illustrated The Eternal Ganga, besides several articles in various well-known magazines and newspapers in India and abroad. His other main interest is the work of British landscape artists in India. He has written extensively on this subject, and his publication include Picturesque India: Sketches and Travels of Thomas and William Daniell, The Raj Landscape: British Views of Indian Cities, The Grand Indian Tour. Travels and Sketches of Emily Eden, Annexation of the Punjab, and Splendid Plumage: Indian Birds by British Artists. Introduction The Ganga occupies an unrivalled position among the rivers of the world. No other river is so closely identified with a country as the Ganga is with India. Nor has any river elsewhere in the world influenced to a gteater extent the life of the country through which it flows. Cities and pilgrimage centres teeming with temples and shrines have sprung up all along its course - milestones in the history of the land and the growth of Indian civilization. The Gangetic plain has indeed been the pole towards which the political, economic and religious life of the country has gravitated. In course of time the Ganga has come to be esteemed all overthe country as beneficent, giver of health and pros- perity and the purifier of sin. 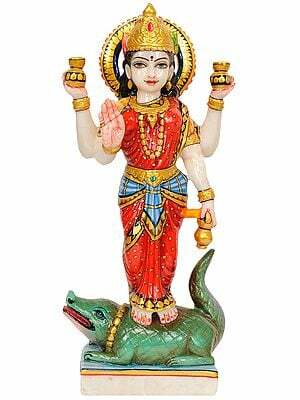 Its water is used as a charm to ward off evil spirits, sprinkled at weddings over the bride and bridegroom, and dropped into the mouths of the dying, besides serving as a medium for oath taking. Based on Megasthenes' account, which is no longer extant, the classical chronicles of India, both Greek and Roman during the first two centuries of the Christian era describe the Ganga as the greatest and largest of all rivers. Strabo, whose Geography is regarded as 'the most important work on that science which antiquity has left us', says that 'indeed it is sufficiently agreed that the Ganges is the largest of known rivers on the three continents'. Arrian is more categorical. All the many rivers of Asia, he says in his celebrated Anabasis of Alexander, 'even if united, would not be fit to be compared in volume of water with an ordinary Indian river, and much less with the greatest of them all, the Ganges, with which neither the Egyptian Nile, nor the Danube which flows through Europe, can for a moment be compared'. While the knowledge of the length of the other rivers of the uncharted world at that point of time was obviously much limited and we know now that the Ganga is by no means the largest river in the world, these statements show that it was .considered as the most important river in ancient times. It is little wonder, therefore, that the river should have caught the imagination of the multitude of foreign visitors to the country through the ages. 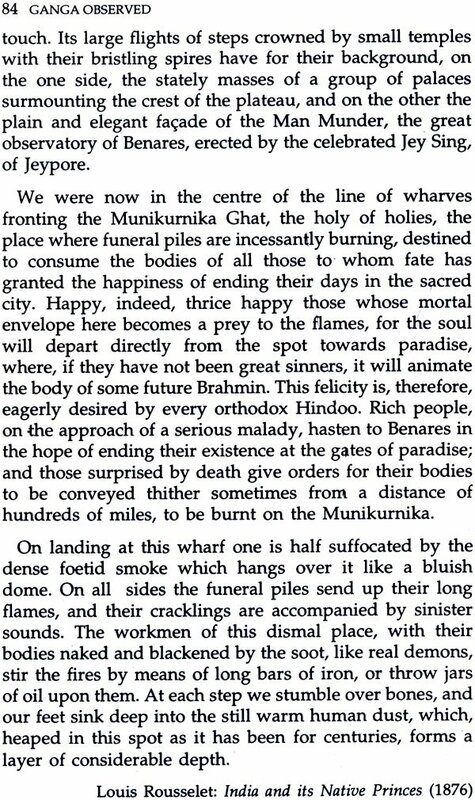 The English traveller Thomas Coryat, who visited India from 1612 to 1617, made an oration in Persian at Jahangir's court telling the emperor that he had come to India, inter alia, 'to see your famous river Ganges, which is the captaine of all rivers in the world'. The story of how a visit to the Ganga by three medieval French travellers got inscribed in a Swedish Church reads like one of the romances of history. Reaching the small Swedish town of Kiruna in Lapland after travelling all over the world in April 1681, they etched on a wooden tablet in the church that they had 'drunk water of the river Ganges' in the course of their 'various adventures on land and at sea'. Travellers of different nationalities and religions visiting India from abroad could not but take note of the Ganga which has so greatly contributed to the social and religious life of the country. They have left fascinating accounts of the river scene observed for over two millennia. The information provided by them is vast and varied, and we find detailed and delightful descriptions of customs and ceremonies, periodical fairs and festivals, flora and fauna and the picturesque spots and pilgrimage centres which they came across in the course of their travels along the Ganga. I have endeavoured in the following pages to capture the enthralling attraction the visitors from abroad felt as they went up and down the Ganga by selecting extracts from their accounts. The basic framework of this anthology is patterned on my earlier book The Ganga Trail: Foreign Accounts and Sketches of the River Scene, published in 1984 and now out of print. I had attempted in that book to interweave contemporary verbal accounts and visual sketches of the Ganga scene by the foreign visitors to India. 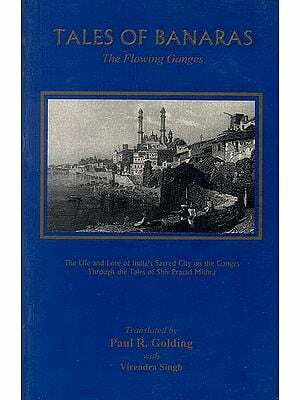 In this compilation are introduced exhaustive extracts from the travellers' accounts of their river journeys culled from a mass of material which I have gathered over a number of years while researching for a comprehensive work on the Ganga. These would hopefully not only interest those who wish to undertake a journey along the river but also delight the armchair traveller. The travellers have been left to speak for themselves in the selected extracts from their accounts handed down to us through the centuries. Brief introductory remarks have, however, been added before selections under different headings in order to provide background information. The artists among the foreign travellers made several superb sketches of the Ganga scene in the eighteenth and nineteenth centuries. Some of these have been reproduced in the book, as they give an idea of the fascination felt by the artist - travellers each time their boat rounded a bend of the river. A large number of the works quoted in this anthology were consulted by me in the India International Centre Library in New Delhi, and I am grateful to Mr. H.K. Kaul and his colleagues for their unfailing assistance. I am also indebted to the staff of the libraries of the Archaeological Survey of India and the National Archives of India; the India Office Library and the British Library in London; and the New York Public Library for extending all possible facilities in the course of my studies there. A number of friends have given me the benefit of their thoughtful criticism of parts of this work, and I am grateful to them all. I must, however, express my special indebtedness to R.K. Kakar for going through the entire manuscript and making many useful suggestions. The spelling of Indian words and place names occurring in the extracts have naturally not been altered. Nor have the archaic and quaint words, spellings or phrases been changed to enable the readers to enjoy some flavour of the original narratives. 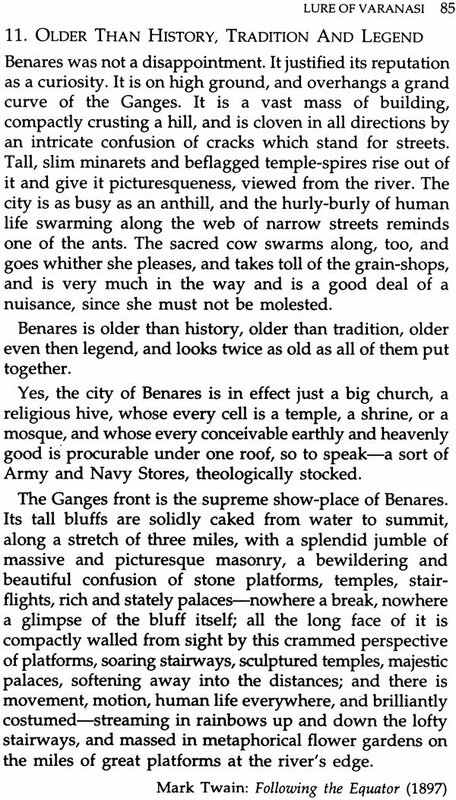 I have, however, used 'Ganga' and 'Varanasi' for the 'Ganges' and 'Benares' respectively in my notes throughout the book in conformity with the current usage in India.